Products & Services | Body-Skins, Inc. This Anti-Static polish is one of the best polishes we can recommend. You can literally polish your clear bra within 10 minutes using this product. It was originally developed for use in aviation windows and is still used today. It goes on easy and wipes off fast without any residual smearing. 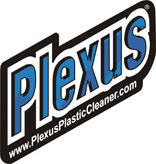 Plexus can also be used for all your plastic surfaces. It is recommended for clear and colored plastics including Perspex, Lucite, Plexiglass, Fiberglass, ABS, Mylar (window tints), Lexan, Acrylite, and all other acrylics, (including painted surfaces). Available from us in 7oz. and 13oz. spray cans. Discounted rates apply to case orders. Please email or call for pricing. Novus Plastic Polishes. A proven winner for over 30 years. Novus first introduced their product in 1973. Back in the day I used this product to remove the rough edges of custom made plexiglass headlamp kits. The results from this product are nothing less than a glass like surface. Best of all, you don’t have to be a pro to get professional results from this product. 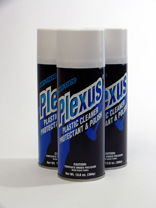 It works on numerous plastics to remove scratches, haziness and abrasions. Due to the porous qualities of clear bra material this product will not work as good as on hard surface plastic composite material. Recommended for use on Plexiglass, Lexan, Lucite, Palsun and Acrylite. Please view the video to see the varied applications of this product. Available from us in 2oz. and 8oz. bottles. Please email or call for pricing. Do you have worn out headlights that could use a touch of our professional magic? Besides being a 3M Certified Paint Protection Film installer we can also rejuvenate your old and tired looking headlights. Polycarbonate lens these days are not prone to breaking like the old glass lens but being plastic now brings up other concerns. Not to worry because our system is tailored to clear up your headlights back to the way they looked when your car was brand new. 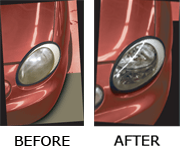 Ask us how we can help your headlights to look new again. Another product that we highly recommend. This products last much longer than the leading competitor and will not harm rubber over long periods of time due to its chemical make up. Available from us in single applicator sizes or during a Paint Protection Film install. Please email or call for pricing.